Iveco’s New Eurocargo has been elected International Truck of the Year 2016 by a group of 25 senior commercial vehicle journalists, representing 25 magazines throughout Europe. The prestigious award was presented to Pierre Lahutte, Iveco Brand President, during the Solutrans gala dinner at the Lyon Chamber of Commerce, France. 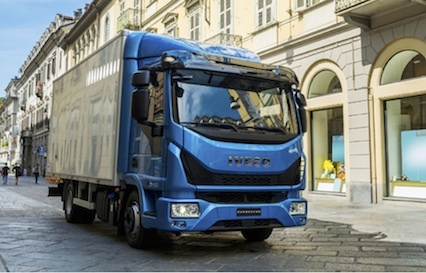 In a neck-and-neck competition, with its winning score of 101 votes, Iveco’s new medium-duty truck fought off a strong challenge posed by Renault Trucks’ C&K range, which finished in second place, while Ford Trucks’ new construction series was third. According to the International Truck of the Year rules, the annual IToY award is presented to the truck launched in the previous 12 months which has made the greatest contribution to road transport efficiency based on several main criteria, including technical innovation, comfort, safety, driveability, fuel economy, environmental footprint and total cost of ownership (TCO). The New Eurocargo cab design, which continues the family feeling of the Iveco Daily, features city-friendly contours with horizontal lines which underline its main focus on multi-drop distribution missions in urban environments, whilst delivering a substantial Cx reduction at higher speeds on motorways and inter-urban routes. Iveco’s new medium duty truck cab interior is a multi-functional âoffice on-the-moveâ with its central console pre-configured to integrate with smartphones, tablets and GPS-based navigation systems, as well as advanced telematics solutions. The latter are managed by the Drivelinc central touchscreen display that offers a user-friendly interface for messaging, fleet management and driving-style support measures. The International Truck of the Year journalists (who all had the chance to drive the new Eurocargo some months ago) praised the advanced features of its driveline, including its SCR-only 4 or 6-cylinder engines that offer improved driveability and fuel-savings as well as lower CO2 emissions. New Eurocargo also boasts eco gear-changing strategies in its two-pedal Astronic automated box, plus an eco-roll function that encourages fuel-saving âcoastingâ. Savings in diesel consumption are also achieved by the use of low-viscosity engine oils and the fitment of a âsmartâ fan, that contribute significantly to the TCO reduction. Moreover, with its Natural Power CNG version Eurocargo Iveco has delivered a viable response to future challenge of ever-tighter restrictions on diesel-engined trucks in major European cities. With its low noise footprint and low emissions the Natural Power Eurocargo is perfectly-suited to urban delivery missions in environmentally-sensitive areas. Summing up the jury vote, International Truck of the Year Chairman Gianenrico Griffini commented: "Iveco has delivered a new medium duty truck that, once again, raises the bar in a highly-competitive segment in which Eurocargo has set the market benchmark in the last 25 years."